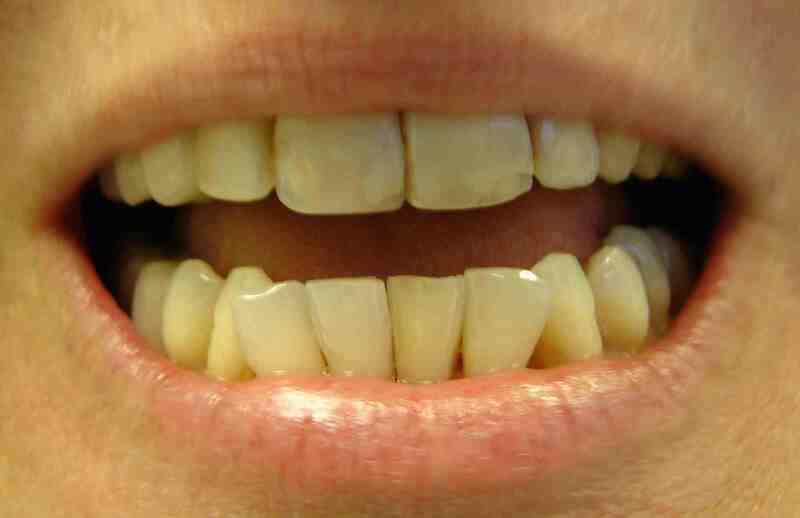 Before: This female patient was concerned about the appearance of her lower front teeth. She believed that the teeth were too jagged and irregular and did not look symmetric. She was not interested in braces or orthodontic treatment at this time, but just wanted the teeth smoothed out and re-shaped. After: Although braces are the ideal way of treating this patient's malposed lower teeth and perfecting their appearance, I believed that 10-15 minutes of reshaping with a drill (no anesthetic required) could greatly improve upon the appearance of the teeth. Three general goals of recontouring teeth are: make them appear symmetrical, make uneven teeth stand out as little as possible, and make teeth appear more feminine in female patients, and more masculine in male patients. Here, the two canine teeth (or "eye teeth") were very sharp and prominently pointy. For this female patient, I smoothed down the sharp points of the the eye teeth to give them a more warm, feminine curvy appearance, since a convention of dental esthetics is that sharp pointy teeth enhance masculinity, while round, curvy teeth enhance femininity. By reducing these prominent sharp tips I also improved on the overall symmetry of the appearance. I also used wide flat sanding drill to flatten the jagged edges of the lower teeth to make them align into a smoother line. A couple teeth were bent at a steep diagonal. I slightly adjusted the sides of these teeth to make them look more straight and less diagonal, to help improve on a sense of symmetry. The overall result is not perfect, but it is far more symmetrical and feminine, with fewer teeth "sticking out." 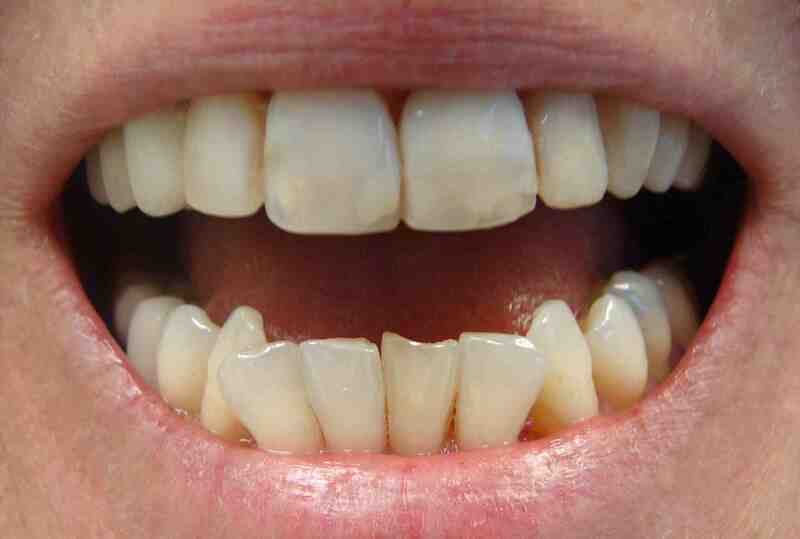 Ideally at least one of these very crooked front teeth should be extracted to create space which will allow for alignment of the remaining teeth using braces. For now, however, the patient received a quick, inexpensive and practical preliminary re-shaping.